The Otterhound is a one that lives to travel in packs as that is a common trait for most sight hounds. They thoroughly enjoy chasing and hunting mammals and are great swimmers. They certainly are a challenge to deter from their chase once they have engaged in one, making it necessary to always have their owner with them when left free to roam in an open field or pond. They are appropriately named an Otter type animal as they adore anything aquatic and are very useful at sniffing and trailing as well. Tough to manage some days, but overall a very loving breed. Friendly with strangers and can easily reside outdoors in colder climates. They are excellent watchdogs for their size and can bond in a home with other pets and children alike. 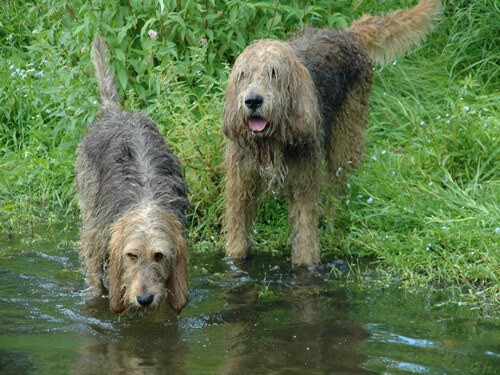 These animals love being in the water, which means if you allow your Otterhound to swim or play in the water frequently you can imagine they will need additional attention when grooming their coats is considered. They do require a large amount of exercise as a daily walk on a leash is sufficient. Rather playful canines the Otterhound is not the cleanest of hounds, as they will need additional care to their beards and their fur coats. They can bark and some do often, and they possess a loud tone when barking as well. They are moderately simple to train as pups and have an average tolerance for residing in warmer temperatures. They will need care from time to time for their large feet and can get debris trapped in their paws from their excellent ability to roam outdoors when in poor weather conditions. The Otterhound possess very deep set eyes with long hairs that can impair their vision, trimming these is a must. They also have a tendency to develop gastric torsion and CHD. Minor cases of elbow joint issues and CTP have also been noted by vets. A very small number of the aquatic canines have developed epilepsy and thrombopathy as well. The DNA can be evaluated for the thrombopathy condition by your vet and they may also advise a simple test for their hips as they age as well. This breed has an average lifespan of ten to thirteen years long and they can weigh up to over one hundred pounds if they are a male Otterhound. With their uncanny similarities to a French Vendeen hound, the Otterhound is thought to have originated from this breed in the 12th century. There is some speculation they may have derived from a water spaniel or a Bloodhound, but still further evidence is needed to support this theory. They were well known to successfully hunt otters, hence the name Otterhound was born. Otter hunting has never quite picked up in popularity, as many hunters prefer their dogs to have the ability to hunt fox or small game. The sport of otter hunting nearly diminished shortly after the Second World War. They are a coveted breed in England and have never really gained any notoriety as show dogs as their fur coats can be too much to cope with to produce a winning Otterhound show dog.